It's baaaaaack. A medium to slow setting solvent adhesive for Plexiglas. Better strength bonds, better looking bonds, better results. 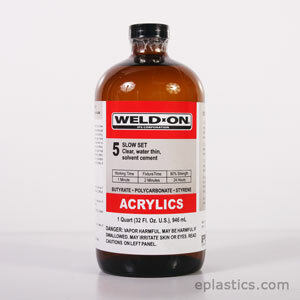 This water thin adhesive is a medium setting solvent adhesive for acrylics (Plexiglass). Will bond other plastics - ABS, styrene, butyrate to themselves. Contains Acetic Acid. For production shops only. NOT recommended for DIY. Not for use in LA, Orange and Riverside counties in California. Why not for DIY, out of curiousity? Hmmm... the acetic acid makes this a pungent glue to work with. Plus, the smallest container is 1QT.